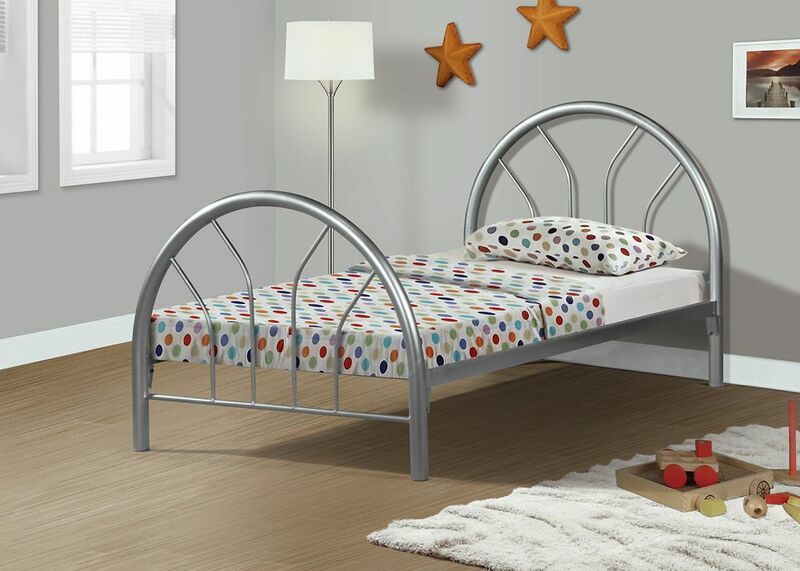 This modern silver metal bed frame offers a simple design with gracious curves that will lend itself to a boy's, girl's or even a guest room decor! Solidly built with 2" metal tube framing, side rails and support legs, this bed will offers stability, durability and style for years to come. Metal slats provide further support to the mattress therefore a box spring is not needed. Add style, elegance and a comfortable element to your bedroom with this contemporary designed full size bed frame. Featuring a chic beige linen-look fabric with stylish antique brass metal nailhead trim and arched cutout silhouette this bed will surely be the focal point of any bedroom. The solid wood black feet give it that extra presence and durability. A standard full size box spring is required. Mattress and box spring are not included. All parts and hardware for assembly are conveniently located inside the headboard. The Taurus Adjustable Bed will bring functionality, convenience, and comfort to any bedroom setting in your home. The black adjustable bed has a quiet built in motor that allows you to control the height of both the head area and foot area separately. It also maximizes relaxation and relieves stress points while sleeping, providing you with the ultimate night's rest. The Taurus Adjustable bed, with its 2 year limited warranty, features a wired mesh layer giving the mattress ultimate support for less motion transfer. It sits up perfectly allowing you to read your favorite book while putting your feet up. Bed - Twin Size / Silver Metal Frame Only This modern silver metal bed frame offers a simple design with gracious curves that will lend itself to a boy's, girl's or even a guest room decor! Solidly built with 2" metal tube framing, side rails and support legs, this bed will offers stability, durability and style for years to come. Metal slats provide further support to the mattress therefore a box spring is not needed.